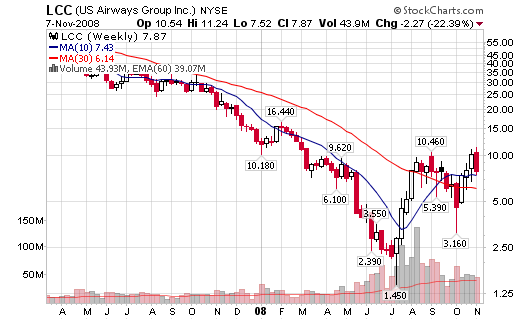 You are here: Home / Stocks / Airlines Lifting Off? 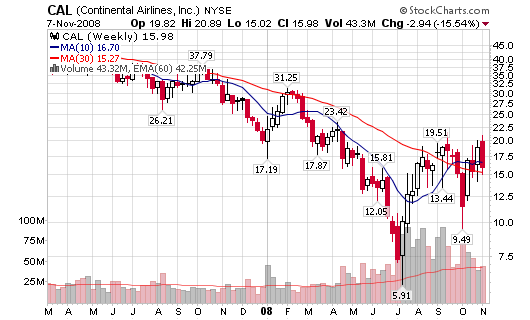 Are the airlines starting to lift off even though the rest of the market is in shambles? Let’s take a look and tell me what you think. 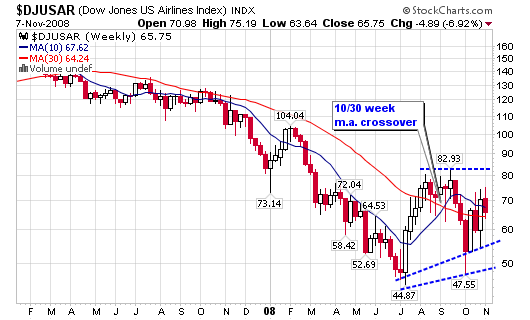 The airlines have made a recent 10/30 week moving average crossover to the upside so I have decided to take a deeper technical look. The group is up more than 63% since the beginning of July, the bottom of their recent decline also known as the pivot reversal. The group was up more than 80% in August (from the low) but then retreated in September and October but the key to this pullback is the fact that it made a higher low than the pivot reversal in July. 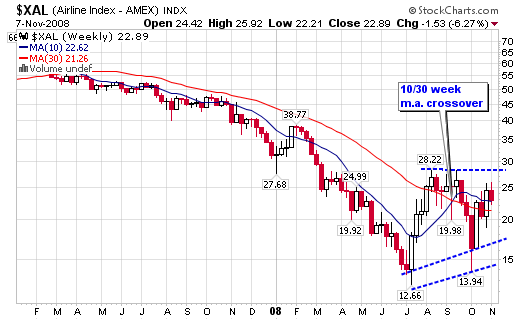 The next key will be to make a higher high than the peak of $28.22 reached in August (this would show strength). I’m not a bottom picker and I am definitely not a big fan of the airlines but I love to spot trends and hop on while they are getting started (if the ‘M’ in CANSLIM is cooperating – it’s not right now). I don’t like the airlines because they can be influenced negatively by a number of factors, including but not limited to a terrorist attack. Let’s not forget to mention the fact that they are not great businesses and have been looked upon as “loser stocks” by some industry veterans. Position sizing, risk management and hard stops won’t help in disaster situations when you are holding shares from this industry and that scares me (risky). Why are you using 10/30 weekly crossover as opposed to 10/40? Is it similar to Stan Weinstein’s method described in his book “Secrets for profiting in Bull and Bear Markets” ? 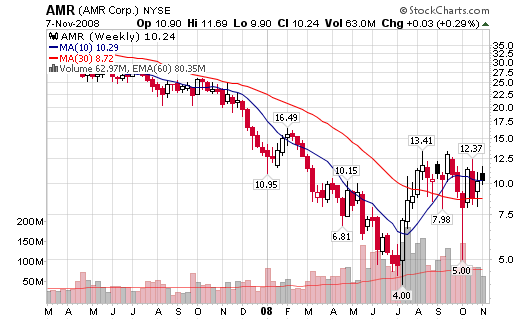 I have been trading the airlines stocks and my main guide is the price of oil. 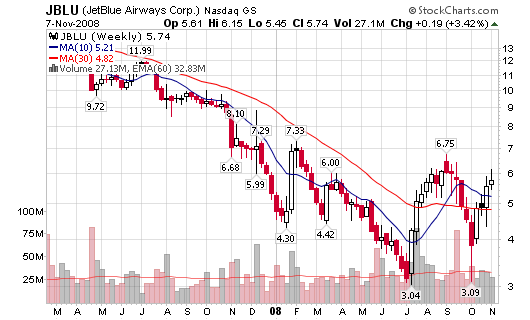 Notice the oil bubble peaked in July and that’s the bottom of the airline stocks. I am using the Stan Weinstein method – it works well for stocks and industries changing trends (catches the trend change earlier than 40-week). As for RE – not so much activity lately. I almost had a pre-foreclosed property in late August but it slipped by me. I think my trip hurt my chances for getting it (would have turned into a solid investment). That’s an excellent point. 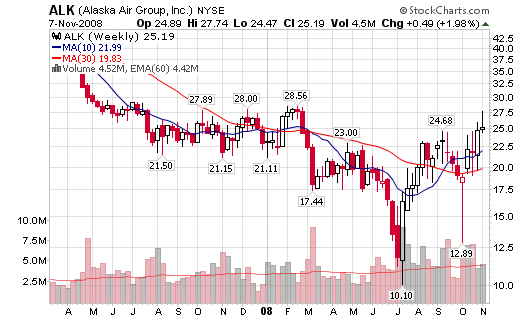 I should do a chart with the airline index and a crude oil overlay. p.s. – Gas in NJ is now hitting $1.99 in areas (a far cry from the $3.69 prices this summer).